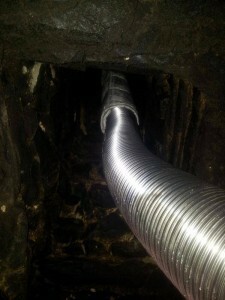 Should I insulate my chimney flue liner? One can insulate a flexi liner by blanket-wrapping it with a suitable material before inserting it (Chimwrap etc.) or by pouring Vermiculite, Perlite or Leca granules into the gap between the liner and flue after fitting. 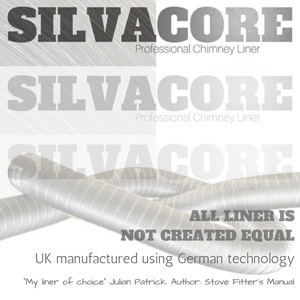 But do we need to insulate when we fit a chimney liner? If the chimney is exposed (on an outside wall), or the stack is particularly tall, or the flue is of a large diameter then the answer to the proposed question above is a probable yes. Insulated liners keep the flue gases warmer, increase the upward speed of those gases and help prevent condensation forming on the liner. Cooling gases also slow down and “dam” the rising hot air underneath, this can cause puffs of smoke to exit via the air vents of your stove (the vents designed to let air into the stove). Having said the above I have fitted plenty of liners in huge chimneys in exposed locations (top of Welsh mountains) and never had a problem. Otherwise it is not necessary, especially if the majority of the chimney is internal within the building. The air between the liner and the chimney wall will insulate the liner (air is a good insulator) although the liner obviously touches a cold wall in many places. 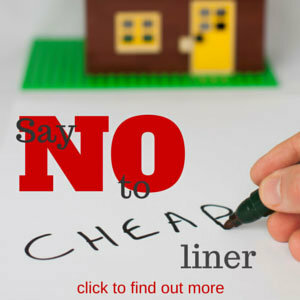 However, it is often not difficult to insulate a liner (just adds cost) so it is up to you. Vermiculite or Micafill: I have my reservations about these methods. This stuff absorbs and retains water so if your chimney leaks water at all the insulation material will gradually get wetter, absorbing like a sponge. This can promote damp walls in rooms that previously were problem free. 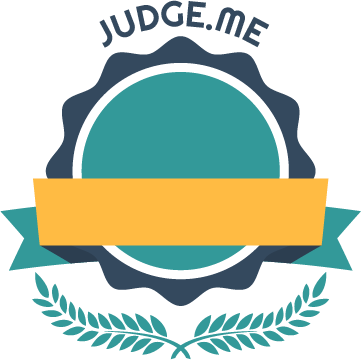 Update 26 Sept 2018: I am a member of an installers forum. A recent discussion on the forum was 95% in favour of NEVER using poured insulation in a chimney. Lots of installers have had problems with damp. Blanket type wrap is fine albeit very heavy making fitting very difficult. There is NO Building Regulation that says you must insulate a liner. However regulations do state that gases must be safely taken away from the building so in theory a stove could be tested on site and could fail this hurdle if the draw of the chimney does not reach the figure stipulated by the stove manufacturer (it is possible to test chimney draw but from my limited experience in these matters a chimney would not fail this test if a liner is fitted, with or without insulation). I have just had a long chat with the Hetas Technical helpline regarding lining and insulating. I was prompted to call the helpline following a call from a fellow Hetas engineer (in his first two years on the job) who had received advice that he was unsure about (unsure only because the subject had not been covered in his training course). The Hetas engineer had been informed by a Hetas inspector that he should always conduct a full “smoke test 1” on a chimney prior to installing a liner and granular insulation. This is not something I have done in the past and so I was surprised. The Hetas Technical Helpline said that this was information that can be found in a British Standard and was now being promoted, as good practice, by Hetas. The reason for this was a number of instances where Hetas engineers had filled chimneys with granular insulation only to find out that it poured into next door’s fireplace due to gaps in the “feathers” (wall between tow flues), three instances over Christmas I believe. I was told that Hetas engineers would soon receive an update about this. Granular insulation – consider it but do you really need it? In my own home I would generally not bother unless the flue was massive – and then I would use Chimwrap. Talking to a few other Hetas engineers reveals that over 95% of installs are completed without any insulation and one engineer I know refuses to add granules due to the possibility of dampness getting into the insulation. Back to smoke testing before adding the liner. I can see the sense of smoke testing if granules are to be added. It would be bad news to find granules pouring into next door’s house (especially if mixed with soot and ending on a beige carpet). Smoke tests with party walls can be difficult – both parties have to agree and both houses accessed during the test. I was advised by Hetas to read The Party Wall Act and will do so shortly (fun). The second item raised by the Hetas installer was that the inspector told him that he should always mix his granular insulation with mortar (6:1 granules to mortar). My reaction to this is one of horror as I believe that if you were to do this then you never be able to retrieve that liner from the chimney. I asked the chap on the Hetas Technical Helpline about this and he said that he would never advise to add mortar for the very same reason (so conflicting advice). Many articles on the Internet say to add mortar but I would never do this to my own chimney (or anybody elses) and have never done this.